It all started with a Facebook status my one time hair dresser posted. It hit me right in the heart. And tugged at my spirit. I could not let it go. I threw on clothes, explained to the kids I had to go on errand, and jumped in the car. My head was whirling. Thirty weeks. 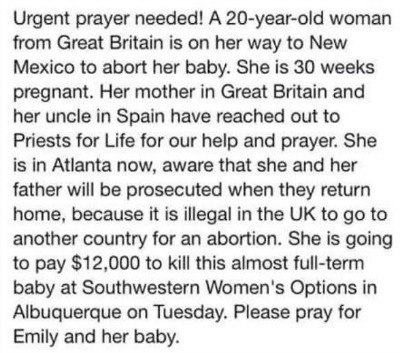 She is thirty weeks pregnant and is traveling across the globe to kill the child within her. Twenty years old. She is only twenty years old and I was the same age when I traveled across a state to kill the child within me. Abortion at thirty weeks. Thirty weeks. My mind flickered to the six times I have been honored to carry a to thirty weeks. The movement. The wiggles. The way my skin would move across my belly as the baby did acrobats. And it made me smile, remembering that amazingness. My mind flashed to the one time that I puked and puked and puked and was overwhelmed with the shocking truth that I was pregnant out of wedlock. The nausea. The fear. The way my life seemed to stand still while everyone else moved forward. And it didn’t make me smile, remembering that aloneness. I stopped at Walgreens to buy two poster boards and two really big Sharpies. I was shaking as I kneeled on the ground to start writing. What to say? Please, please don’t do this! I know you must be scared and feeling desperate, but there is help. You don’t have to choose abortion. You can choose life even if that seems impossible. They are going to lie to you in there. That life you feel moving inside you, it wants to live. And you can still have your own life if you choose adoption. Even though we are perfect strangers, I really do care and I want to help you. If you kill this life, I promise you will regret it. If you allow this child to live, you have so many options. Please, please don’t let others make decisions for you. Let’s talk. Your chances for breast cancer will increase. Your risk of suicide will increase. A part of your heart and possibly your mind will decrease. You will still have to deliver this child. You don’t get to get out of that now. But it will be dead. Dead within you. Whatever your father is telling you about why this is the right choice, he’s wrong. While $12,000 is the fee for the abortion, you can make an adoption plan right now and place your baby in a loving family for free. Completely free. And there are people here who will help. Right now. I will adopt your baby. Let him or her live and I will love him or her forever. I promise. Please, don’t go in that door where the lies and the people who don’t love you are and will not let us in. Please. I couldn’t, of course. I stared at the blank white space as people walked around me. I’m sure I looked a bit wacky. Please let us ADOPT your baby instead of aborting! 20 yo? From the UK? Please stop… I have been you! Come talk to me! I followed my GPS to the abortion clinic. The late term abortion clinic. The late term abortion clinic which people travel from all across the country. And world. Because in this office, they will kill whatever is in in the womb, as long as it hasn’t been born yet. Women’s Options. Oh my golly. What a big fat lie. I joined the silent protesters. I had no idea what to expect. This was my first time to see the doors of an abortion clinic since I had mine in 1990. I was incredibly nervous. To say the least. Over twenty people held signs of various appeals. There were women, children, and men. They were praying. They were staring. They were waiting. The escorts and her father rushed her into the door. She didn’t come out before I left, two hours later. I wept off and on for those entire two hours. As I stood there, hoping and praying, all I could think about was what was happening inside. A late term abortion requires days. The first step is to kill the baby. Then the mother’s cervix is slowly dilated. The woman stays at a hotel and travels back and forth to the clinic for treatment. Rumor has it that most of the time, the mother delivers the dead baby in the hotel room toilet. I learned that Tuesdays are typically the busiest days because the clinic is closed on Mondays and the goal is to be done with the process by the weekend, requiring starting on Tuesdays. Tuesdays have the highest chance of a baby still being alive when you see a women enter the clinic. Here is how Southwest Women’s Options lays out the plan for a third trimester abortion. They say you can call for pricing. The horror I went through laying on a cold table to have an abortion at only nine weeks was more than enough for my mind. To think of what this young woman was about to start going through and what she was putting the unborn child through, I simply couldn’t and still can’t fathom it. During my afternoon outside of this clinic, two other young women arrived with their support people. One looked like she was with her mother and one with a boyfriend. They walked right in. Didn’t look at us. I don’t know what they heard, but I said the same thing every time. The helplessness I felt as they parked and strode in was overwhelming. I wanted to shout. I wanted to weep. I wanted to hug understanding into them. But I couldn’t step past the sidewalk. And I couldn’t make them understand. The tears were a part of my prayers. They fall as I type this. The weight of the horror and the helplessness are so heavy. Twenty-three people standing outside in the cold, silently praying and hoping, while a staff of people serve women who want what they want and know where to get it. With a culture that tells them it’s a reproductive right and that it’s not a life. With doctors who have sworn “to do no harm”. Were there protesters the morning I walked into the clinic? Were they praying for me? Were they wanting to step over the sidewalk and hug understanding into me? Does Emily know that we really do want what is best for her? for her baby? for both of their futures? I stayed until the protesters who have done this many times started leaving, knowing that appointments past 2:00 don’t usually happen. Knowing that if the women hadn’t come out at this point, then they had already started the first phase of the abortion. Some come back to offer help in the healing just as they offered help in the decision making. I’d really like to do that in the future. I felt numb. And really, really tired. I sat for almost an hour after I left. Alone. Unsure how to process. A kind of shell shocked. Friends, abortion is not only a sin, but it’s horrible. Abortion at thirty weeks…. shameless and a kind of evil that I can’t even comprehend. The fact that our nation and my state of residence offers abortion services until delivery is a kind of heinous atrocity. More than $12,000 spent for the abortion, travel, and such just weeks before the child could be adopted at no expense to Emily. And there are so few people protesting, standing for life, praying for the women and men who enter. And those who work there four days a week. Will you please join me in praying for the services this clinic offers to no longer be wanted? to be no longer be available? for all of the Emilys? To be home study ready and waiting for a baby as I watch one enter a death clinic so close to being born, my heart and mind nearly broke. It was a hard hard day. But I’m going back because now I’ve met the ones who hope beyond hope outside the late term abortion capital. And I don’t want them to be alone. And I want every Emily to know there were people who cared standing there. I won’t be able to think of Tuesdays in Albuquerque the same ever again. 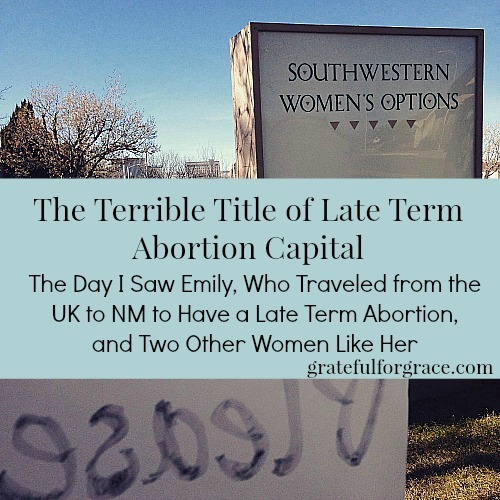 Did you know late term abortion costs $12,000 and a trip to New Mexico?